2a. Which MJ Rules To Learn? 2b. Which MJ Rules Do I Play? If you appreciate the free information on this site, your donation would be gratefully accepted, and would help keep this site running as a free service. Thank you! Want to find players (or mah-jongg teachers) in your area? This bulletin board is one tool you can use; FAQ 15 describes more ways to find players, and FAQ 4A contains a dedicated list of teachers. In addition to players and teachers, you'll also find events and tournaments listed here on this bulletin board. Please do not ask me if I have any names of players or teachers that I am secretly withholding from this board and from FAQ 4A - why would I do that?? I post all players and teachers who contact me, and I am not withholding any names. So, please, don't ask!! A lot of people have posted announcements that they are looking for players like you! You could scroll through the entire list, but a better way to find people in your area is to use the Find/Search function in your Browser to search by city or state. If you're on a Windows computer, press Control-F (Command-F if you're on a Mac). If you use an iPad, tap the Search box in the upper right corner of your Safari screen. (It's a box with up arrow on top, this will open 2 rows of possibilities, scroll over to “Find on page” which opens up a search bar at bottom of page, type in item looking for, and it tells how many matches and highlights them. - Thanks to Susan S for this detail!) You may need to try different key words for your search. After your search, if you don't find anyone, I'm sorry, but this is all the names that I have. I swear that I am not withholding additional names, so please don't ask me if I have more names in your area, because I do not. If you don't find anyone on this list or in FAQ 4A (teachers) or FAQ 15 (players or teachers), write your own announcement and email it to me and I'll post your announcement below. That's the best I am able to do. EMAIL YOUR ANNOUNCEMENT to Webmaster@Sloperama.com to submit your Find Players/Teachers post. In your email, you must specify your location (just city, state, and maybe zip code; do not state your street address) and what kind of mah jongg you play (most American female players play "American/NMJL" mah jongg - if you do not know which variant you play, read FAQ 2b). Due to the actions of spammers, all users' posts go through me; I post them manually. That means you cannot expect your announcement to appear within a few minutes of your sending it to me; allow several hours at minimum. Entries that do not provide sufficient information will not be posted. No information you provide through this website shall be deemed confidential. Don't ask questions here. If you have a question to ask, use the Q&A Bulletin Board. This board is for announcements only. NO SHOUTING. Nobody is allowed to shout on this site except the webmaster. Typing in all capital letters is regarded as "shouting" on the internet. If you use all capitals in your post, it will be converted to lower case before being posted. Non-mah-jongg advertising may be blacked out or deleted. EVENT ORGANIZERS: Please send your announcement in text-only form for easy posting. No PDFs. We can post an image here (just one image per announcement), but the image must not exceed 400 pixels in the largest dimension. Images must be JPG or GIF or PNG attachments in an email (not a link, and not pasted into the email; no DOC files, no PDFs). Links must show complete URL in the link title (not like this, but rather like this: http://www.w3.org/TR/html401/struct/links.html#h-12.1.4). When announcing an event, please include the year in which the event is to occur. or just email webmaster at sloperama dot com. If you have already posted on this board within the past year, and if your post is still visible below, PLEASE DO NOT ASK US TO PLACE A NEWER ANNOUNCEMENT unless you have moved to a different city, or your game has changed to a different day of the week, or some other substantial change has occurred in regards to your posted information. It annoys the webmonster. Legal Notice: owner accepts no responsibility for verifying the accuracy of any of these listings--please use your discretion in contacting fellow potential players. "When you email me, I own it." The price of the information I give is that it is given only in this public forum. Emailing me with a question or comment on the topics covered here constitutes permission for your email to be made public. (Business inquiries and scholar/journalist queries are of course treated with all due confidentiality.) Thank you. Live in Los Angeles and want to learn? My name is Tom Sloper, and this is my website. They call me "Mr. Mah-Jongg." I wrote the definitive book on mah-jongg East & West, "The Red Dragon & The West Wind." I will teach you ANY kind of mah-jongg (American, Chinese Classical, Chinese Official, Japanese, Hong Kong, Taiwanese...!). Classes at your home or at a neutral location. Private lesson cost varies depending on class size; you need to have a minimum group size of four students. You can email me at . I also teach classes at AJU's Whizin Center (wcce.aju.edu/) two or three times a year; contact AJU through their website. And more teachers are listed in FAQ 4a as well as below (search this page for your area). Before contacting me or another teacher, it's a good idea to read FAQ 2, so you know which kind of mah-jongg you want to learn. (When emailing posters listed here, substitute the symbol for card suit symbol, or green dragon or red dragon. I am looking for a group. I am new to the area. Clinton, Phillipsburg, Lopatcong New Jersey. Thank you for all you do for this amazing game. >I am reaching out to tell you about Mah Jongg for Memories, an exciting new event for the Alzheimer’s Association’s The Longest Day fundraiser. Through this event, the generosity of Mah Jongg players will soon be helping to fund care, support, and research for the over 5.8 million people in the United States who are living with this disease and other dementias, and their nearly 16 million caregivers. >Here’s what Mah Jongg for Memories is all about. Around June 21 (The Longest Day of 2019) Mah Jongg groups across the country will be dedicating their regular play-days to the Alzheimer’s Association by making donations to the cause. Also, other players will be holding more elaborate and larger day-long fundraising events. Some will have lunch and silent auctions, while others will enjoy snacks and donate their day’s winnings. All, however, will combine the fun and challenge of Mah Jongg with the objective of ending Alzheimer’s, the all-consuming disease that threatens the mental ability of every Mah Jongg player. >We are asking for your help in spreading the word about Mah Jongg for Memories to your students, groups, and other Mah Jongg players. If any of your contacts want to get involved, we can help them get organized. We hope you will join us as we connect Mah Jongg groups around the country to create a significant impact on future research and services. >I would love to meet with you or set up a call and can even quickly help you or others register for this event online. If you have questions or would like more information, please contact me at 323.486.6447 or reply to this email. Let’s get “crakking” to have some fun and fight Alzheimer’s at the same time! Tom - Can you please add my name to your list of teachers. I can teach and play. Are you interested in learning to play the exciting game of Mahjong? Would you like to improve your game or need a refresher course ? I am an experienced Mahjong teacher and professional tournament player. Happy to help you learn or enhance your game. Private lessons or group offered in my Southern Village Home. Flexible hours. Please call 410-570-8987 or text. Michelle Cassell. Small fee for every two hour lesson. Lessons will include instruction manual and no set is required for the first lesson. Mah Jongg Monona plays every Wednesday at 1 PM at the Monona Public Library. We play the 152 tile game with four players. All levels welcome. Please bring your own NMJL card. If you do not know how to play, please contact the Monona Senior Center to have your name added to the list of people who are interested in lessons for beginners. Looking to join/ organize a game of American Mah Jong in Riverdale, Ny 10471. *New Riichi group is looking for more players, experience not required. I saw on your website that you have a list of teachers and I am wondering if i can be added to it. I teach Beginner, Intermediate and Advanced Strategy/Tournament readiness. Teaching 10+ years. Private lessons or classes. Please let me know if you need anything further from me. I am currently on vacation in Royal Palm Beach, Florida. (33411) I'll be here for another two weeks. I'm an intermediate player and have been playing for only 2 years. At home in New York State I play twice a week and friend's homes and at a Senior Center. I would love to find a friendly game while I am here in Florida. Thank you! Hi! A couple friends and I want to learn how to play! Any leads for lessons/classes would be helpful…. I’ve found a couple on weekdays but we all work so we would need evenings or weekends…. Willing to travel to orange county, Pasadena area if necessary. Please email- mpsd521♦msn.com or text to 909-573-5656. Hello, looking for an intermediate or advance group to play American Mah Jongg. Can you please add the information below to the list of people who may be looking for a game? First, thank you so much for all of your teaching. You are such a gift to this game! Second, we are looking to form a regular game in Saugatuck, Michigan. That's on the west side of the state, 2-3 hours following the lakeshore from Chicago, IL. Same travel time from Detroit, MI, about an hour from Grand Rapids, MI. We will likely play on Tuesday afternoons. We have a good location and several people who wish to learn, a few experienced players. We are looking for more players, especially experienced ones who can help new people learn to play. At the moment we have more people wishing to learn than we do teachers! my wife & i live in aliso viejo, ca (92656). We would be interested in private or group lesson. Can you help? My name is Kimberly Boone. I am a teacher in Loveland Colorado. There are clubs all over the northern Colorado region. My number is 307-217-3250 if anyone wants one. I would appreciate it if you could post my information on your website. I am interested in teaching mahjong. I have been teaching in my over 55 community for 2 years. We are looking for two intermediate players during Christmas week. We are vacationing until December 28th. American Mahjongg with ladies-looking for advanced players to sub on Tuesday afternoon and Thursday morning. Bonnie at 917-399-6929 for rates and location. I play American Mahjong using the National Mah jongg League card on Wednesday evenings at the Arlington Heights senior center at 1801 W Central in Arlington Heights Illinois 60005. I'm there as early as 4:30 in the evening and we play until 7:45 and we have to leave before they close at 8 pm. We play at a table in the lobby. I would like to post a new request. Location: Ocean or Monmouth County, NJ (Toms River, Brick, Jackson, Howell, Lacey, Bayville, LBI). Looking for: A game, players, or to start a new group. Preferably Friday nights, Sat/Sun afternoons or evenings, flexible weekday evenings. I am a beginner but a quick learner. I have a Mahjong set and cards that we can use. Willing to travel, find a local spot or can host at my place. We play American Maj-Jongg and are looking for a Thursday afternoon player to join our game. We are intermediate players and play every other week. We are a friendly group and would welcome anyone with a card and quarters. Bloomfield Hills/Birmingham/Berkley Michigan 48072 I am just learning the game so would love to find a teacher and a group. The mah-jongg variant I play is: American. Come one come all! I live in Marlboro, NJ 07746, I play American. Looking for an experienced player to play on Fridays during the day or Mondays at night. We play with a pie and our money limits are larger then the usual. I live in Plainview and am looking for players nearby either to start a new game or join an existing game. I am an experienced player but enjoy the social aspect of mahjong , not too serious. I also am part of a game in Smithtown on Monday afternoon and we need two more players since two of our ladies moved. Please contact me at my e-mail address or home phone number. 516-433-4116. Thank you. I am looking for students interested in learning Mah Jongg and I will host 4 people Oct 15,2018 at noon for 2 hrs and then every Monday following for 4 weeks. This will be at my apartment in New York City, 10024, Upper West Side. We will be learning American Mah Jongg and fee is $25 per lesson. I am looking for American/NMJL players in my area. Upper Westside NYC 10024 upper beginner looking for American game. Try the Find Players & Teachers bulletin board. Also check the teachers listed in FAQ 4A. If you don't find anything in either of those, then read FAQ 15. Enjoy your site – thank you. Can you list the following please? Can play both afternoons and evenings. Happy to help you with your game. Have good natured women playing each week. I am looking for a game in Mt. Dora or surrounding area that needs an experienced player or 3 or 4 women who want to start a game. My set and my quarters are ready to play. My kind of mah jongg is: Japanese Riichi. We are new players & would like to learn and play more with ones in our community. Thanks for any referrals you can furnish. And by the way, to search your web page for players, etc., from an Apple device (Safari, such as the iPad I’m using to write you), one can go to the upper right hand corner, click on box with up arrow on top, this will open 2 rows of possibilities, scroll over to “Find on page” which opens up a search bar at bottom of page, type in item looking for, and it tells how many matches and highlights them. Hope this helps for other browser users - did for me! I play American mah jongg and live in West Los Angeles (Brentwood). I am looking for a game that needs another person or for 3 or 4 other women who would like to start a game. I play American version. I am temporarily located in Orlando area while my husband is working in Winter Park. We are from Fort Worth, Texas and will be returning as soon as his office is ready in Dallas, Texas. I would love to play with tile friends either in Winter Park or in Baldwin Park where we have a temporary executive lease. I have my card and my quarters. I live in Chicago zip code 60601. Experienced player. I’m looking to join a group or start a group with experienced players. I’ve been playing for 7+ years and have recently moved to this area. I’m available on weekdays anytime. 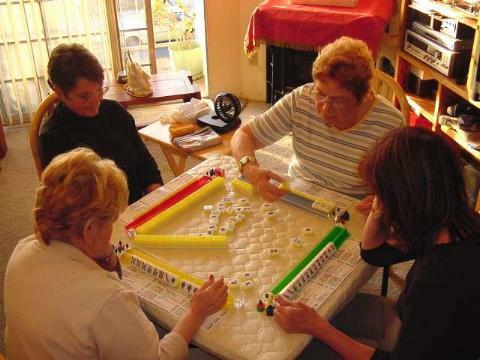 We are a group of ladies who play American-Western Mahjong every Monday afternoon at someone’s home in the San Mateo, California area. Our experience ranges from 5-50 years of playing experience. Should be familiar with the tiles, have a card and have playing experience for a while. Please contact Gail Hirsch at Gailmail10西gmail.com, 650-619-8723. I live in San Clemente, CA (92672) and am looking to join a Mah Jongg game/group. I enjoy playing with all level of experience (I have played Mah for over 30 years). >I am looking for an instructor in the classic or traditional Chinese Mahjongg. I learned many years ago from my grandmother, and I have started a 14-person group but play a modified version and scoring version. I would like to learn the true game complete with scoring. Pardon me for interjecting myself into your Find Teachers post. I just think you need to know what I have to say about your search. Your first problem is that the "classic" Chinese rules are not widely played anymore. That game is scored in a way that caused a lot of upheaval in the 1920s when the game first made its way to America. In China, nobody plays that way anymore. So it's unlikely you'll find a teacher experienced in teaching the classic system in your local area. Second, precious few mah-jongg teachers even know genuine "classic" rules. And when you find a teacher who teaches Chinese mah-jongg, she'll only be able to teach you a different "modified version and scoring" than what you already play - or maybe it's not that far off from what you play (but it certainly won't be "classic"). I don't know why you want the classic rules, but if you really want the classic rules, your best bet is to learn it from a book or website. Since you already play, you aren't likely to get confused by the slight differences you may find. I list books in FAQ 3 (but I can tell you now that the best book on classic rules is Millington), and websites in FAQ 4B. You can link to the FAQs above left. But to get back to your reason for wanting different rules. Why don't you tell me what it is you want to accomplish? If you just want "genuine," be prepared for disappointment (your skilled players and your unskilled players are going to grow to hate one another). If you want "better than what we play now," then you'll have to tell me what's wrong with the system you use now - what does "better" look like? I wrote FAQ 2A to help people choose the best variant, depending on what one wants from a rule set. If you want simple scoring, go Hong Kong style. If you want more tiles and simpler gameplay, go Taiwanese style. I really don't recommend Classical scoring. Looking for a group in West L.A.
>Zoe G████ suggested that I contact you. I am an intermediate mah jongg player, and I am looking for a group in West Los Angeles. I wish Zoe would have told you about my Find Players Bulletin Board. I posted your email there so you can either (a) be contacted by players near you, or (b) find players who've posted their availability. I don't keep a database of players, and I don't try to play matchmaker. Everything I have is on the BB. Next time you see Zoe, please tell her about the BB. Hope you find a game! Oh - if you don't want your contact info on the web, I can delete the post on the BB, and I can sanitize the one on the Mah-Jongg Q&A Bulletin Board. The mah-jongg variant I play is: I am looking to learn and will accept any variable to get started. I am available after 4pm weekdays and on weekends any time. Beg./Intermediate player looking to play in the afternoon preferably. The mah-jongg variant I play is: American NMJL card. Prefer daytime game. Lapsed intermediate player. Looking to put together an evening game of American style Mah Jong with experienced players. Hoping to play one evening a week. I live in Wylie, TX but will play in many other areas including Plano, Richardson, Murphy, Garland. My group Is looking for experienced players for Tuesdays, Thursdays, and/or Fridays. We play at a community center in Phoenix from 10am to 3pm and stop for lunch at about 11:30AM. Please contact me if interested in any of these days. The mah-jongg variant I play is: I don’t know. Hi, I live in Nassau County, New York. I am an experienced player and am looking to join a daytime game in my area. Please respond if you are in need of another player. I live in Plainview. Intermediate Player looking for summer game in the Hamptons! Hi my name is Alexis. I’m located in the Homer Glen-Lockport area and would like to join a Mahjongg group that plays regularly. I’ve been playing for about 15 yrs, have played in tournaments and enjoy playing for money. I play quite often at temple Beth Shalom in Florida and friends homes. I’d like to find a friendly group to enjoy the game with. ?? Maj jongg game. I have been playing for years & love a fast game! I can travel to Albany. I play using the American Mahjong League card. I have been playing for over 10 years and am brand new in Santa Monica. I’m looking to get into a game(s) here. Do you know of anyone who teaches in South Orange County from Irvine to Dana Point? New to eastern LI. Looking to start a game with experienced players. Looking for a weekly afternoon game. The mah-jongg variant I play is: American mahjong. Looking for experienced good players for a Tuesday weekly game on the east side of manhattan. The game starts at 12:45 pm and usually ends at 4:30 pm. Looking for English speaking Riichi players in Tokyo. Any experience level. I'd still consider myself a beginner. Hi I am looking to form a group for woman who live in or near Massapequa New York. I play the American version and am looking to play on the weekends during the day. Please contact nan444★optonline.net if you want to play weekends on a regular basis. Karmela ... brand New player just learned how to play.. The mah-jongg variant I play is: American. Looking for a couples game, in the evening. My husband and I both play and would enjoy an evening game with another couple. I am also looking for an afternoon game with the ladies. Thank you. Looking to join an evening game or Sunday day game. Looking for MahJong/MahJongg players in Lake Charles, Louisiana. Level is not important. We can play Chinese Simplified, Hong Kong, or American. Just want to find people to play and start to play regularly. This is a request to announce a Mah Jongg Marathon for Charity to be held April 17th at Hampton Hall Club and sponsored by the Hampton Hall Charitable Foundation. The cost per player is $40. Single players and groups are welcome. Buffet lunch included and raffle prizes are planned. Please see the attached flyer for more details. I would like to recommend you two upcoming MCR Mah Jong tournaments: Both are part of the traditional Austrian – Italian Gourmet Cup which takes place this year for the eighth time. Both tournaments are MERS1, 7 rounds 120 minutes each. We’ll play in very nice locations with delicious food and drinks – of course it’s a “GOURMET CUP”. I’d be happy to play with experienced players or beginners. I’ll even be happy to teach people who are willing to learn! Looking for a weekly game in the downtown/Hillcrest/Mission Hills/other central San Diego area. I am a strong intermediate player and would love to join a local group! The mah-jongg variant I play is: I play American Mah Jongg. I’m looking for a steady game. Hi Tom, thanks for posting this. Seeking mah jongg players in SE Wisconsin. I'm just north of Milwaukee and willing to travel to the Wisconsin southern border, Madison, Manitowoc. Weekends only, day or evening. I play American NMJL, but would enjoy learning traditional Chinese style as well. I'm a good player, and I don't care what level you are. Hi Tom. Can you please post? Sunday, April 29, 9:30 a.m. - 5:30 p.m.
Join us at our Annual Spring Mah-Jongg Tournament to benefit the Women of SSTTE. A not-to-be-missed event that has players returning year after year! $50 pp by 4/13. $60 pp between 10/13 and 10/25 if space allows. No refunds after April 13. Check must accompany reservation. RSVP on our website by April 13 but don't wait as past tournaments have filled up before the deadline. CLICK HERE to go back in time and read older Player/Teacher postings! To request removal of an outdated or erroneous posting, please email the webmaster. When emailing the webmaster, specify which bulletin board you are talking about. THIS is "The Find Mah-Jongg Players" bulletin board.